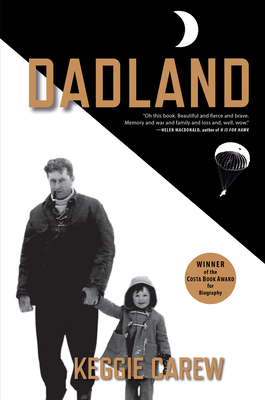 Dadland (Paperback) | Eagle Harbor Book Co.
Keggie Carew's father had more than his share of mysteries about him, and her compelling account of trying to fill in the blanks makes for a very satisfying, poignant, and humorous read. Tom Carew's extraordinary exploits during World War II include parachuting into France and Burma to lead resistance movements. Following years of estrangement during her father's marriage to a zealous, overprotective stepmother, Keggie's attempts to reacquaint herself with him take on complexity as he slips into dementia. In spite of all that remains unsolved, this kaleidoscopic view of a man of many parts is a triumph of biographical writing. Keggie Carew grew up in the gravitational field of an unorthodox father who, despite his technicolor life, always remained an enigma. After decades of estrangement, Keggie reunites with him just as his memory begins to fail. As she sets out on a mission to unravel the secrets of her father's past she quickly finds herself on a rollercoaster journey into surprising corners of twentieth century war and peace. During the Second World War, Tom Carew was an undercover guerrilla agent, parachuted behind enemy lines to help raise guerrilla resistance first against the Germans in France, then against the Japanese in Southeast Asia, where, as a sarong-clad twenty-five-year-old he was called the "Mad Irishman" and "Lawrence of Burma." In peacetime he lived on his wits and irresistible charm, but these were not the best qualities to sustain a family. Part detective story, part history, and part biography, woven together with Keggie's personal experience of growing up with her dazzling yet challenging father, Dadland is an epic story of success, failure, grief, jealousy, madness, mischief, memory, and most of all, fierce love. Keggie Carew has lived in London, West Cork, Barcelona, Texas, and New Zealand. Before writing, she made her career in contemporary art. She has studied English Literature at Goldsmiths University of London, run an alternative art space called JAGO, and opened a pop-up shop in London called theworldthewayiwantit. She lives near Salisbury, in the UK.